Everyone knows Halloween is really all about the candy! May treats abound and tricks be few! 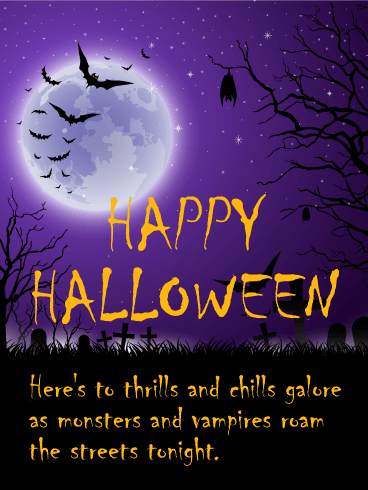 Here's a spooky Halloween card that's loads of fun for kid's of all ages. Wish a day of peculiar fun with a Halloween card covered in pumpkins and cobwebs galore. Make it a Halloween to remember and send this deliciously spooky greeting card to your favorite ghoul or ghost. The pumpkins are coming! Are you ready? If you have a costume, you are! Disguise yourself and trick-or-treat the night away. 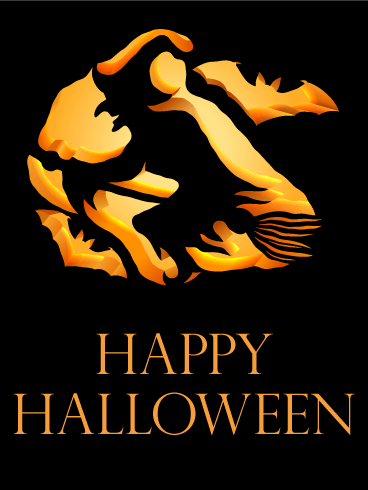 Send your friends a fun and eerie Halloween card with mischievous jack-o-lanterns. Wish them a fantastic Halloween with tricks and treats to spare. Get them in the Halloween spirit with this creepy and silly greeting card and send it today. Creepy and funny! This Halloween card starts off creepy enough, but ends up funny. That's what this holiday is all about anyway-to get the spooks and laugh about it. 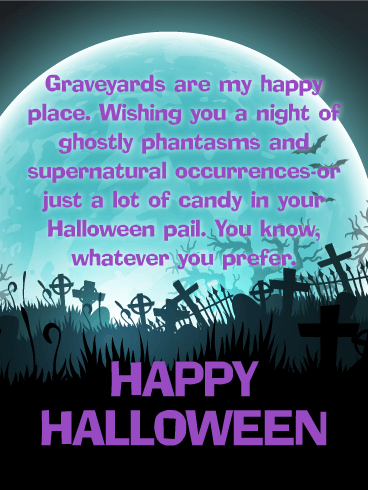 Scare yourself silly this Halloween and send a graveyard of fun to your friends with this spooky Halloween greeting card. We're all a little ghostly on Halloween. 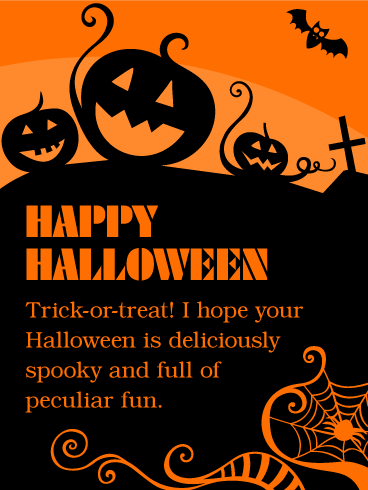 Join the fun and send this clever Halloween card today. Halloween is a chilling night, but also thrilling! Here's to goosebumps galore and a creep-tastic good time. 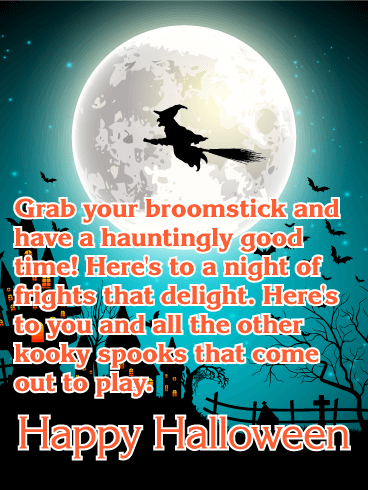 Send this haunted Halloween card and get your friends in the spirit of this frighteningly fun holiday. All the monsters come out tonight. But with Halloween costumes prepared, we are ready to join the band of witches, vampires, and ghouls! 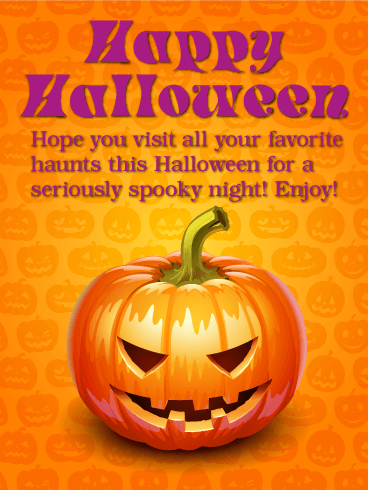 This creepy Halloween card is a fun way to celebrate a night of chills and thrills! Brew up some Halloween magic! 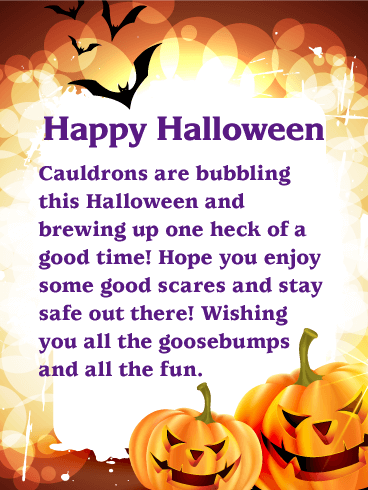 Let the cauldrons burn and bubble, and cast a spell for fun this Halloween! Send this thrilling Halloween card to wish someone a happy and safe holiday. Jack-o-lanterns send a Halloween greeting to enjoy all the goosebumps and all the fun. Wish all your friends and family a happy Halloween with this perfectly fun and creepy Halloween card that's just too good to pass up. Let the haunting begin! Halloween is one of the most anticipated holidays of the year. It's the chance to spook your neighbors and maybe even yourself! 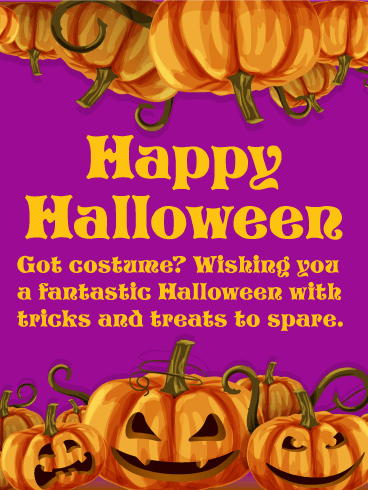 Send Halloween cards to all your friends who can't wait to put on their costumes and party the night away. A Halloween card is a nice treat to balance all the mischief they might get into! Delight your friends and family with this striking Halloween card. The detailed close-up of a witch and bat carved into a jack-o-lantern will amaze your friends and family. Simple orange lettering completes the Halloween message. You can't go wrong with this attractive Halloween card.